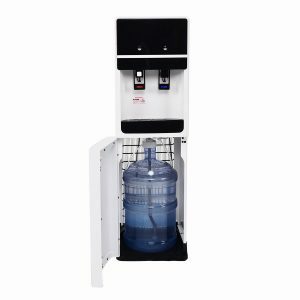 Costway 23358-CYPE is a late 2017- hot new release bottom loading water cooler and dispenser with a sleek and elegant appearance and stainless steel cold and hot water reservoirs. It can be used with the 5-gallon water bottles and is suitable for home, dorm and office use. Costway Water Cooler is totally hassle-free and easy to operate with just a couple of taps for hot and cold. There will be no ugly water bottle out in the open as it will be hidden in the bottom section. And as this is a bottom loading type water dispenser you will not have to do any heavy lifting over this fairly tall unit. You’ll find two switches at the rear of the water cooler, green stop cooling, and red stop heating. It already uses up lower energy than normal and by switching the green or red switch or both you will save on power usage. Because the compressor will not run constantly or the water will not be heated constantly. What you will get is the room water temperature when the hot and cold are turned off. There is a user-friendly safety lock on the hot water tap so you do not have to worry about burning accidents. This unit heats the water at up to 203 degrees Fahrenheit (range of 194 and 203F), which is perfect for making a hot cup of coffee or tea or instant noodles or oatmeal. And the lowest cold water temperature is 42.8 degrees (range of 42.8 to 50F) which is like a normal fridge temperature and will let you have those chilled drinks on those hot days. Costway 23358-CYPE has a modern design, looks good with a great white and black finish and should fit in well with any room decor. The 304 stainless steel cold and hot water tanks at the back of the unit are good for keeping the purity and taste of water. With this unit, you can have up to 3.2 liters of very hot water and 1 liter of very cold water per hour. It has a good size detachable drip tray that helps avoid the mess and makes cleaning an easier task. 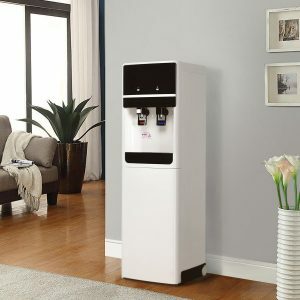 White and black Costway Water Cooler measures 12.2L x 12.6W x 41H inches and will not take up much room wherever you wish to put it. It has a 90 watts cooling power and 350 watts heating power (120 volts and 60 Hertz). It is easy on the eyes, works well and generates a fair amount of hot or cold water as soon as requested, should prove durable due to its build quality and is priced reasonably. It is certainly good value for money and we do not hesitate to recommend this great new product.